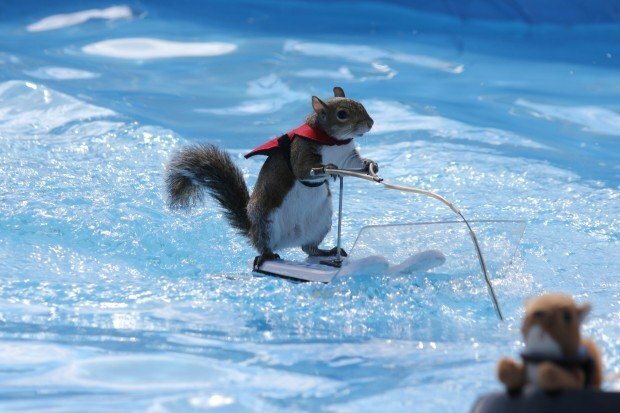 Twiggy the Waterskiing Squirrel spends his days teaching children and adults alike about water and boat safety. Damian Rico | Times Media Co.
(From left) Trainer Lou Ann Best watches as Twiggy has fun on the head of Schererville's 9-year-old Adriana Vizcarra. MICHIGAN CITY | It all started with some compassion and a joke. That was 33 years ago, before Twiggy took his act to Hollywood, and beyond. 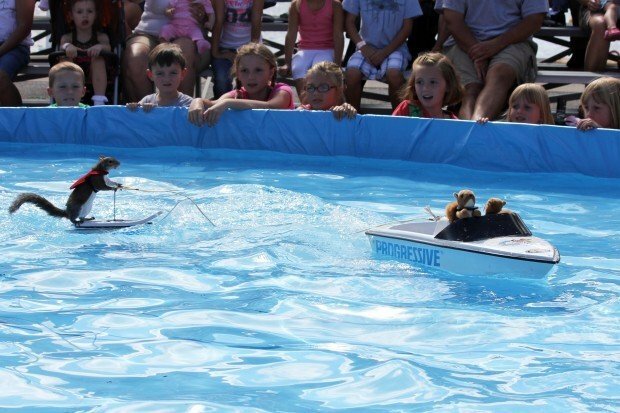 Twiggy the Waterskiing Squirrel spent last weekend at the Michigan City Water Boat Show teaching children and adults alike about water and boat safety. "We found the first Twiggy in 1978 after a hurricane and we nursed the baby squirrel back to health," said Lou Ann Best, Twiggy's mom and trainer. "My late husband Chuck was teased by his friends when he bought our daughter a remote control motor boat for her birthday. So he kept it himself and taught Twiggy to navigate and eventually waterski." Best said that the local media picked up the story and that was the beginning of Twiggy's non-stop fame. Twiggy's weekend appearances were sponsored by the Michigan City Port Authority and included lessons about water and boating safety with emphasis on the importance of life jackets. "Twiggy has a long history of performing at the boat show and appeals to all ages," said show manager Ken Alvey. "We always try to make this a family event and Twiggy is a great help." Twiggy has been featured on "The Late Show with David Letterman," "Good Morning America," "Animal Planet's Amazing Animals" and has performed in the United States, Canada, Bermuda, France, and Germany. Water and boat safety is near to Lou Ann's heart because it "hits home." Best's husband Chuck died of a heart attack while saving his stepfather from drowning. "It was a lot for me but prayer and the power of teaching others about safety kept my husband's legacy alive in my heart," said Best. Best says they are on their eighth Twiggy and all of the squirrels are orphaned. Best will continue to tour the world with Twiggy and teach safety as long as the "good Lord wills it."